* This product is not manufactured or distributed by Pharmacia & Upjohn Company LLC, owner of the registered trademark Rogaine®. 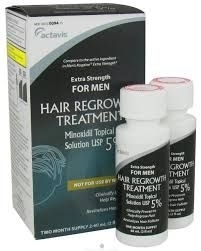 To regrow hair on the top of the scalp (vertex only, see pictures on side of carton). - Apply one mL with dropper 2 times a day directly onto the scalp in the hair loss area. - Store at controlled room temperature 20° to 25° C (65° to 77° F). Keep tightly closed. Alcohol (30% v/v), propylene glycol (50% v/v), purified water. For more information on this product, please call 973-993-4500.